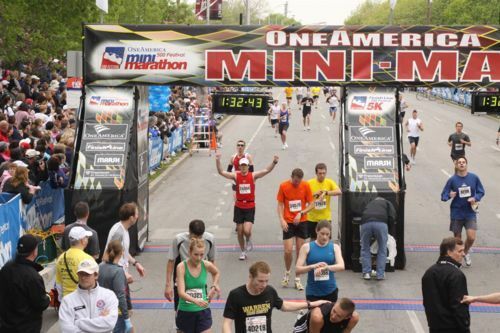 My Run: Overall, the One America 500 Festival Mini-Marathon (Mini) in Indianapolis was my eighth half marathon. This was the third year in a row that I have run the Mini, which is the largest half marathon and fifth largest road race in the U.S. with 35,000 runners. The Mini is part of the month-long 500 Festival that leads up to the Indianapolis 500. 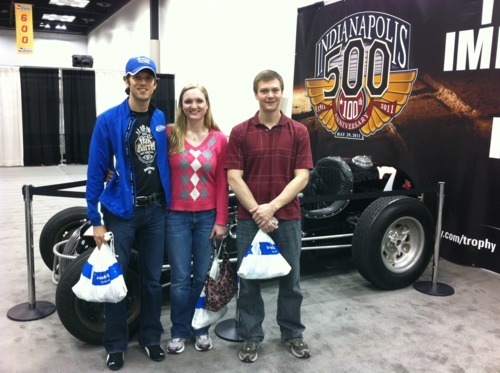 I traveled to Indianapolis with my wife Olivia, and my good friends Paxton Baker and Nathan Wright. We also met up with our friend Marti Carrell in Indianapolis on the morning of the race. 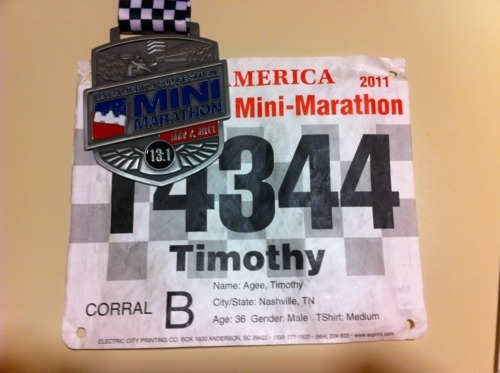 Nathan had run the Mini with me in 2010, but it was the first time for Olivia, Paxton and Marti. Paxton, Nathan, and I all started the race together in corral B. My goal for the race was to break 1:30 for the first time. 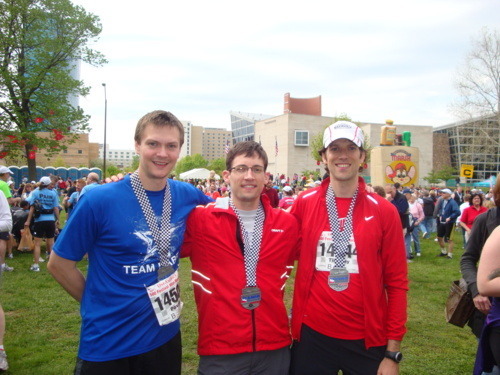 My PR was 1:31:00, which was at the Murfreesboro “Middle” Half in October 2010. I was hoping that the additional emphasis on speedwork in my training combined with the extremely flat course would make this possible. Nathan’s stated goal was to “run fast,” while Paxton was shooting for a 1:31. The weather was almost ideal. It was an overcast day and temperatures were in the 50s for the entire race. The only issue at all was the threat of rain and slightly elevated humidity. Even though the race start is divided into corrals, and we were in corral B, the absence of a wave start, and the narrow opening of the start area results in a very congested first couple of miles (more on this below). To break 1:30 I would need to average 6:52 minutes per mile, and was only able to complete the first mile in 7:20 due to the congestion. I stayed with Nathan and Paxton for most of the first mile, but tried to focus on running my own race and separated from them before reaching this first marker. Over the next few miles, I began to drop my pace below 7:00, and managed a couple at 6:51 (Miles 3 and 4). Even though I was feeling pretty good overall, 6:51 just did not feel comfortable. By the 6th mile, I was struggling to hit anything better than 6:58, and knew that 1:30 was going to be a VERY long shot if I did not feel better quickly. Over the 2.5 miles of the speedway, I tried to pick up the pace since the surface is completely flat and very smooth. However, I was still not able to crank out either of the miles faster than 6:58. My second mile on the track (8th mile overall) was actually 7:03. I still felt ok, just didn’t have the extra gear needed to maintain a 6:52 average. As I left the track, my 9th mile was 7:02. For mile 10, I tried one last time to make up some ground on a long straightaway and cranked out a 6:54. However, I faded slightly over the next two miles with a 7:03 and 7:09 respectively. As I was running the 11th mile, I began checking over my shoulder looking for Paxton. Coming into the race I knew that Paxton was capable of running a faster race than me, and felt confident that he would make a big surge at the end. I never did see him, even through the 12th mile. 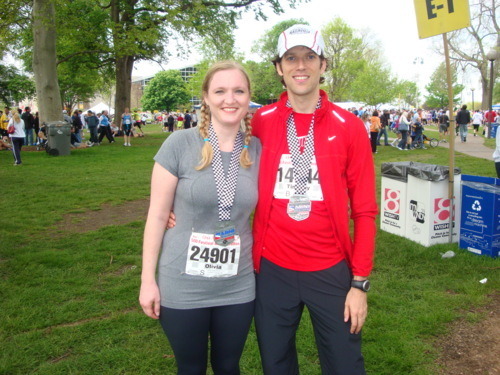 For mile 13, I knew that 1:30 was long gone, and that setting a new PR was unrealistic. With that in mind I stopped looking for Paxton, and just tried to put everything I had left into that last mile. That mile was 6:38, and it felt like my legs were going to fall off of my body. During the final mile, the course has markers every 1/4 mile. With 1/4 left to go, I heard a voice from behind say “hey Tim!” It was Paxton, and he was powering toward the finish. For some reason, when Paxton reached me I said “Let’s burn it out!” We both picked up the pace even more, but that only lasted a few strides for me before I had to drop back. Paxton surged ahead and was looking strong. I saw him begin to slow just before the finish line, and I tried one last time to catch up to him, but I had nothing left in my legs. I finished the race in 1:32:00. This was exactly one minute slower than my PR last fall, and two minutes short of my goal. Even though I missed my goal, and a new PR, I was happy with the finish and truly believe that 1:32 was everything that I had for that day. This time was good enough for 703 overall (out of 30,643 finishers), and over 10 minutes faster than my finish time in the Mini last year. On a complete side-note, this was the first long-distance race (1/2 marathon or greater) that I completed in a “minimalist” shoe. In my case it was the Saucony Kinvara, and they were fantastic. I’ve primarily been using my Kinvara’s for track workouts and shorter races (5k, 10k, etc). Now I’m seriously considering making these my everyday trainers, and also trying the Saucony Peregrine’s for trail running. 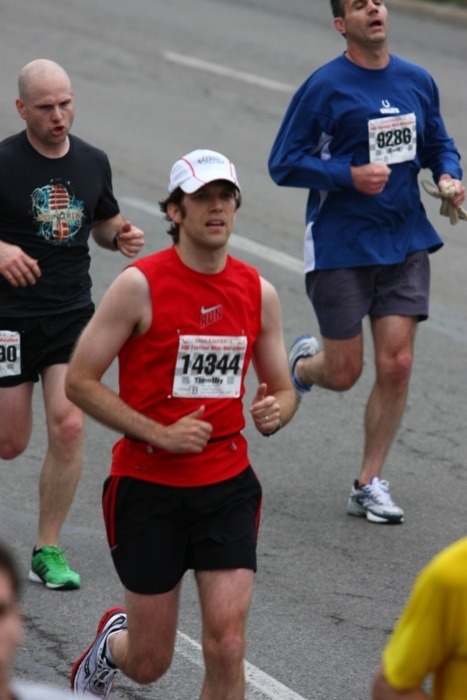 Friends and Family: I mentioned earlier that Paxton had caught me during the last 1/4 mile of the race. After the finish, we went back and looked at the split times for both of us. At the 8 mile mark, Paxton was around 4 minutes behind me. He cut that to around 1 minute by mile 10, and caught me in the last 1/4 mile. What an incredible second half of the race! I was actually very happy for him, and proud of the way he finished the race. His finish time was 1:31:51, good enough for 687 overall, and almost 5 minutes faster than his previous PR set at the Mercedes Half Marathon in Birmingham earlier this year. My wife Olivia came into this race with a strain of the connective tissue that holds the calf muscle to the bone. I was concerned it might be a stress fracture, so suggested that she get it checked out before the race. Her doctor diagnosed her with the strain last Wednesday, and recommended that she only walk in the race, and not attempt to run. However, Olivia purchased a compression sleeve for her calf and decided to attempt her normal run/walk ratio and back off if the pain became a problem. Thankfully, her calf was never a big problem and she was able to finish the race in 2:46:00, just over a minute off of her PR which she set in the Mercedes Half Marathon back in February. Marti had told me that she was hoping to break two hours for the first time (about 4 minutes faster than her PR). She said that she knew in the middle of the race that she didn’t have sub two hours in her, but she still finished in 205:35. This was only 40 seconds or so off of her PR, and was good enough for 37th in her age group (not bad at all with > 30,000 finishers). This was my third road-trip race to do with a group, and was an absolute blast. Running trips are so much fun. The race is great, but the camaraderie of the group surrounding the race is what really makes it a great trip. 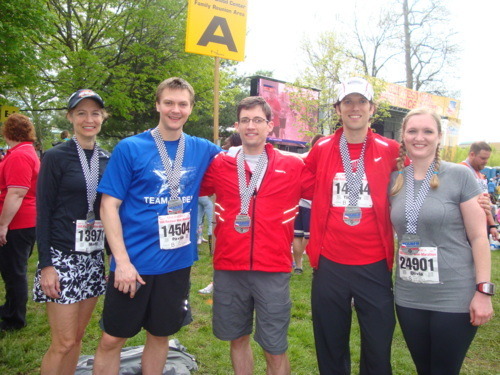 The Race: Overall, I would give that race organizers an “A+” – It is hard to come up with many criticisms of this event. The organization from the expo to the finish area is impeccable. The course is flat and very unique (see more below). All Mini participants received an long-sleeve technical t-shirt, and a technical running hat. The finisher’s medal for 2011 is a really cool design that incorporates an Indy car with elements of the Mini and speedway. There were 17 aid stations (“Pit Stops”) on the course (plus multiple stations at the start and finish area). There are signs identifying the aid stations well in advance. While it is great that there is plenty of fluid, the number of stations is a little bit overwhelming, and causes frequent course congestion. The reason for the high number is that each station has either water or Gatorade, but not both. Seems like an easy way to ease some of the congestion would be to combine these stations. I am always happy to see Gatorade as it is my favorite sports drink, and like most big races, the water and Gatorade were in different cups, making it easy to distinguish. The mile markers were elevated, making them easy to see, and all included split times. The finish area is the best I’ve ever seen with regard to congestion. There is plenty of room to keep moving, and the volunteers immediately give you a bottle of water after finishing. After receiving your medal, all finishers are given a plastic grocery bag for all of the post-race food (great touch). They had bananas, fruit cups, cookies, chocolate milk and Gatorade. Also the post race picture area is well laid out, and does not cause undue congestion. The bag check location was clearly marked at the race start and finish and there are LOTS of port-a-potties. The post-race party is located in a park just outside the finish area. While there is lots of food at the party, it all costs money, even for finishers. Would be nice to see a few more substantial food options for the runners that are included with the race. Another couple of nice features include the Chronotrack B-tag timing system that is buil-into the race bib. This means runners don’t need to do anything but wear their bib in order to be timed. Also, all of the bibs include the runner’s first name, which ultimately leads to the crowd cheering for you by calling out your name. The race does not feature pace teams, however this is not as big of a deal in a half marathon vs. a full. 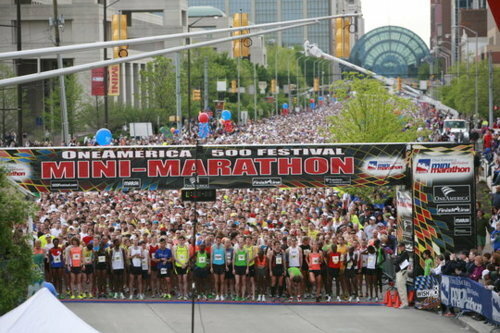 Some might be critical of the lack of a wave start given that there are 35,000 runners. There are definitely pros and cons to a wave start. The big pro is that it eases congestion at the start. The big con is that it leaves some corrals up to 40 or 50 minutes behind gun time. For one I don’t mind large races that have some congestion at the start. 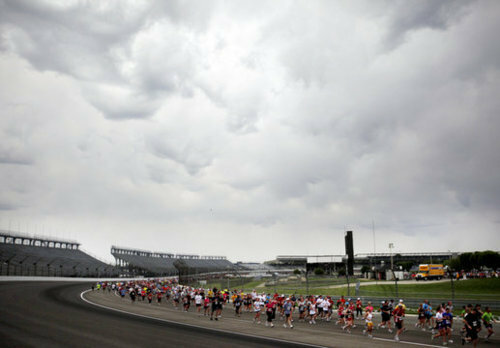 The Course: The course starts in downtown Indy, and includes a lap around the 2.5-mile Indianapolis Motor Speedway before returning to downtown Indy for the finish. While there are some mundane portions of the course between downtown and the speedway, there is LOTS of on-course entertainment including bands, DJs, cheer squads, etc. The lap around the Speedway is fantastic. I’m not a big car racing fan, but this is a really cool experience. 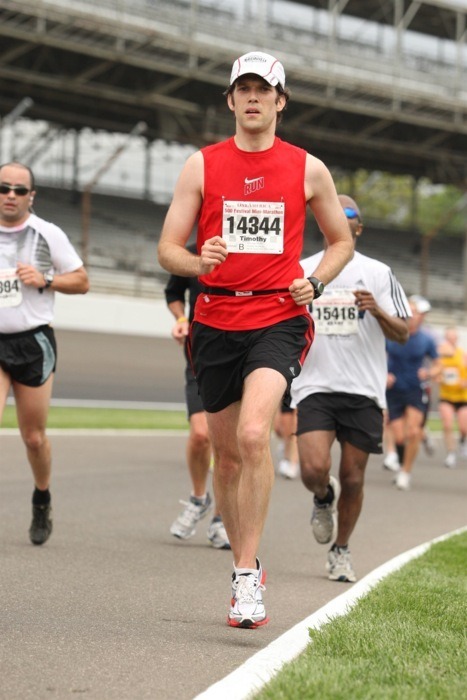 The asphalt is perfect, and it is exciting to run across the yard of bricks at the start/finish line. The course is FLAT. There is one very minor incline during mile 2, and then a short, sharp ramp-like incline into the infield of the speedway. Other than that…Pancake flat. Crowd support is pretty light, except for the final mile where there are lots of spectators, and even stands at the finish. The final stretch across the river, and back into downtown is really exciting, and gives you that added boost you need for the finish. All-in-all this is one of the great road-races, and one that should be on your bucket list if you’ve never participated in it. Other race directors could learn a lot from the Mini, and it’s incredible organization. • Good fan support on the at the finish. • Elevated mile markers with split times. • Limited post-race food options for finishers. Unsolved Mysteries – Lesson 6: Where Did Melchizedek Come From?